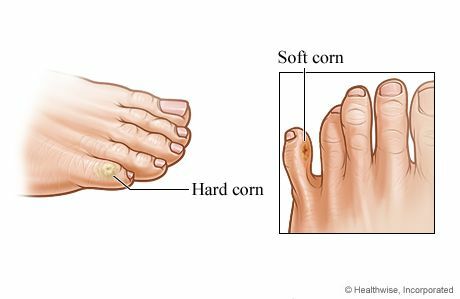 A soft corn develops in between toes, rather than on the toe like the other type of corn (hard corns). It's usually pea sized and can look like a little bump, a blister, or an open sore. Soft corns develop from toes rubbing together. Shoes that are too tight shoes, socks or stockings. If your feet sweat excessively, that will make the problem worse. If the soft corn gets worse or does not get better, you should see a podiatrist.